João Gaspar is the Head of the Department on Micro and Nanofabrication of INL – International Iberian Nanotechnology Laboratory – and Leader of the Group on Microfabrication and Exploratory Nanotechnology. His research activities include the development of micro and nanofabrication processes and advanced silicon machining, general process integration and packaging, high-throughput wafer-scale testing and reliability of MEMS materials and devices, resonance and optical applications, electret- and piezoelectric-based 2-D resonant microenergy scavengers, sub-100-nm transducers and sensors, micro- and nanofluidics, microneedles and capillary arrays for intracellular recording applications and related post-CMOS processing. Author of ca. 80 scientific papers and more than 100 proceedings, his work has been presented at about 130 conferences. 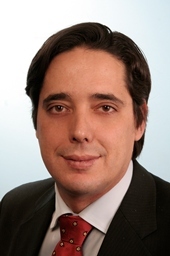 In addition to his activities with industrial, EC and national partners, João is also Auxiliar Professor at Técnico from the Technical University of Lisbon.